Printed Cotton – Jersey Sweatshirt, Christopher Kane via Net-A-Porter. Rockstud Leather Bracelet, Valentino via Net-A-Porter. Floral Print Blouse, Lulu & Co via Matches Fashion. Square Floral Print Sunglasses, Dolce & Gabbana via ASOS. Pashli Grained Leather Backpack, 3.1 Phillip Lim via Browns. Floral Jacquard Skinny Jeans, Jigsaw. 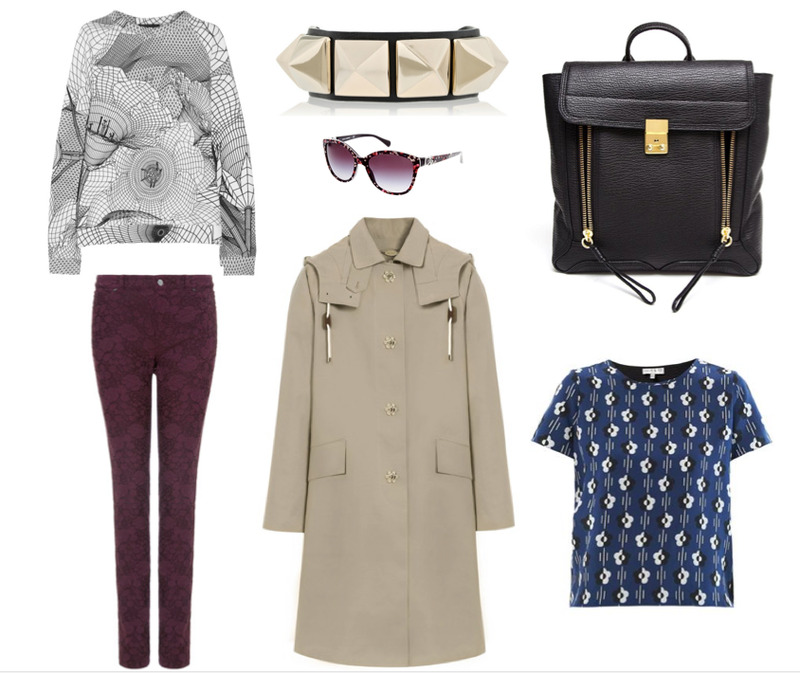 Mackintosh, Mulberry via Net-A-Porter. Call me optimistic, but I think it is never too early to add some florals into your Winter wardrobe! With this selection, you can add the print which is usually reserved for spring time, into your current collection. The loosely shaped cotton jersey top from Christopher Kane is a fabulous comfortable yet fashionable piece with its dreamy fleece lining, and the soft monochromes will look classically casual with some leather leggings or over a black leather skirt. I’d team it with this chunky Rockstud leather bracelet from Valentino; I am seriously loving all the Valentino Rockstud designs at the moment, but this black leather number with rose gold studs is a timeless choice. An easy way to add florals to your winter wardrobe is with the Floral Print Blouse from Lulu & Co, the dark blue with white flowers is a lovely accent to black tailoring and you can inject florals into your look without getting too girly. It may be Winter but on those rare bright mornings, these D&G sunglasses are a must-have accessory offering full UV protection. Keep them safe in this Pashli Grained Leather Backpack from 3.1 Phillip Lim. Ok, it’s not floral, but it’s BEAUTIFUL so that’s allowed! For a slim, neat silhouette in my favourite shade of the season, the Jigsaw jeans are incredibly wearable, I’d pair with a classic silk blouse. Of course, I couldn’t do a floral post without mentioning the Mulberry for Mackintosh collaboration! The two British brands have met up to create some seriously lust-worthy designs, and the classic design of this Mackintosh mixed with Mulberry’s signature flower postman lock has rocketed straight to the top of my lust list! The macs are handmade by the careful craftsmen who have completed three year apprenticeships and are exclusive to Net-A-Porter. What do you think of florals? Too early? Or a subtle way of brightening up your Winter wardrobe? Next Post DIY Smoothie Packs – A Healthy, Easy and Scrumptious breakfast!